For the second time in two years, the students on the Standard Life–HEC Montréal Fund (SLHECF) team took first place in the Redefining Investment Strategy Education (R.I.S.E.) 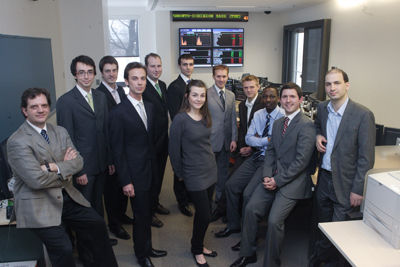 Forum, in the balanced portfolio management by graduate students category. This annual competition is organized by Dayton University in Ohio, in partnership with the United Nations Global Compact. The 9th R.I.S.E. Forum was held from March 26 to 28. This year, the R.I.S.E. Forum attracted some 2,600 students, faculty and professionals from 275 colleges and universities, representing 70 countries. The winners were selected on the basis of their portfolio’s performance during the 2008 calendar year. Created in 1999 with a $2 million donation from Standard Life, the Standard Life–HEC Montréal Fund now has a market value of about $3.5 million, making it the second-largest student fund in Canada. The fund invests exclusively in shares of Canadian companies listed on the Toronto Exchange and in Canadian government and corporate bonds. For purposes of the competition, the students are grouped by university and act as portfolio analysts and managers. Martin Boyer and Nicolas Papageorgiou, both professors with the Department of Finance, oversee and supervise the students, with the help of a Standard Life representative and two representatives from Standard Life Investments.